I remember a song called Popcorn by Hot Butter that played repeatedly in my childhood brain. Popcorn meant good times, party, and the silly fun kids have on summer days in Southern California. Popcorn can still be the party animal. Check out this popcorn party package by Wabash Valley Farms . The Whirley Pop Stovetop Popcorn Popper is more than just a stove top popper. 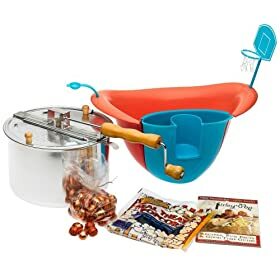 It includes a special bowl with a popcorn launcher, basketball hoop, remote control holder as well as room for your sodas. There’s a party in the house and everyone is invited. The Whirley popcorn popper is an old time favorite but I love the Stir Crazy popper because you can watch it pop. That little bowl with the basketball hoop would make a perfect gift.